The species is widely scattered as far north as central Scotland. Its distribution on the Continent is poorly known. Singa hamata spins its web on low vegetation usually in damp habitats, for example damp pasture and raised bogs but also in areas of rough unmanaged grassland. A pinkish retreat containing the egg-sac can often be found on vegetation near the web. Both sexes mature in May and June, the females lasting through to October. 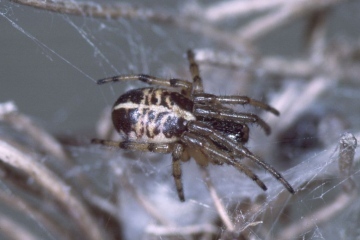 The spider may be abundant in some localities but is very local. The loss of raised bogs and damp pasture, particularly through drainage, and the regular cutting of grassland poses a significant threat to this species. Where damp pasture is still present grassland cutting should be on a rotational basis so that areas of long grass and herbage within the pasture are left each year to provide a permanent habitat for S. hamata. Of particular importance are well established tussocks of long grass and where possible these should remain.